Outside a lepers’ colony in Navi Mumbai, India, is a small chapel. The diversity that exists amongst its visitors is what makes the chapel such a special place, writes Ashleigh Green. Outside a lepers’ colony in Navi Mumbai, India, is a small chapel. Painted in both Hindi and English on the outside of the chapel, it reads: “My house will be called a house of prayer for all peoples”. The chapel welcomes people of all faiths, and is visited by lepers who have been rejected from society. For these individuals whose own families have abandoned them, God is their only refuge. Religion doesn’t matter anymore and denominational differences are irrelevant. While the individuals in the lepers’ colony don’t necessarily believe in the same god, their common belief in the divine is enough to sustain them, to empower them and to enrich them in their destitution. I have visited this chapel twice, on both my trips to India. The diversity that exists amongst its visitors is what makes the chapel such a special place. Had the chapel only opened its doors to lepers of a particular religion or denomination, it would not be the sacred place that it is today. Over many years, the chapel has been infused with tremendous depth, diversity and human experience. This depth and diversity of human experience is what we are celebrating on Harmony Day (March 21), with this year’s theme being, “Many Stories: One Australia”. If you locate the word ‘harmony’ in the dictionary, you are likely to find two meanings. The first definition will describe harmony as a situation in which people live or work well with other people. The second definition will describe harmony as a musical term that occurs when different notes are played at the same time, making a pleasant sound. Harmony, in the music world, is a pleasant, beautiful thing. It doesn’t simply occur when three amateur singers gather for the first time. Learning how to harmonise takes time. It requires you to listen to the other person, and to create your note in accordance with theirs. This year’s Harmony Day theme calls us to remember that difference is no barrier to harmony. As humans, we all have unique and vivid stories. Our backgrounds are diverse, and harmony, in light of this, is about encouraging individuals and communities to flourish in their uniqueness. Since the nineteenth century, people have been travelling to India for spiritual enlightenment and for release from the material world. Largely responsible for India’s rich spiritual landscape is its multitude of faiths, and it is not unusual to see a mosque, a Catholic church and a temple on the same street. I remember entering restaurants in Mumbai to see symbols above cash registers that represented the religions of each employee. My friend’s father, who owned a chicken shop, would add and remove different faith symbols from his shop as employees came and left. Last July I spent a month in India co-ordinating a photojournalism training program for children in two orphanages. I assisted the children in visually documenting stories that were important to them. Whilst working with the children on their projects, what stood out was the way that faith was so entwined in the children’s lives. Faith, in India, is so deeply ingrained in the daily activities of the ordinary individual, from the rickshaw driver, to the woman in an AIDS hospital, to the teenage girl in an orphanage. While several faiths exist, both in the orphanages and in the broader society, differences are no barrier to harmony. Differences are acknowledged, but at the end of the day, these differences give society its fruitfulness and flavour. One of the girls who participated in the photojournalism program was 15-year-old Pooja. She was determined, from day one, to do her final project on her childhood, and to return to the slum area where she grew up. As a young child, both of Pooja’s parents passed away. When we returned to the slum area where she lived as a child, Pooja informed me that she wished to photograph the temple where her mother once prayed everyday. Pooja described her mother as a woman with a deep faith, and it became clear that this temple was an important connection between Pooja and her mother. Serina, Pooja’s friend, chose to do her photojournalism project on everyday life in the orphanage, so I asked her which six photographs might best represent her life. According to Serina, the first and most important photograph was to be taken in the chapel, and she also wanted to take a photo of the girls praying at night, “Always we are praying. In the morning, at night, before school and before meals we pray. I pray for my family and friends, and I pray for poor people”. The girls practise yoga every morning, and the session begins with each girl bowing down before God. They show such respect and sincerity as they perform this daily ritual, and attempt to comprehend the being that gave them this new life in the orphanage. When we remember that as humans we are vulnerable, it doesn’t matter that your best friend is photographing a temple, while you are photographing a chapel. It doesn’t matter that your best friend is Hindu, and you are Catholic. When we enter the mindset of the leper or the orphan, we remember that we are vulnerable. We all need faith in something bigger than ourselves. And when we connect with others on this basic, human level, our differences become something to celebrate. They add richness and colour to our communities, and turn them into beautiful patchworks of human experience. 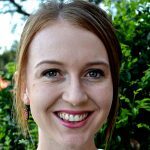 Ashleigh Green is the Community Engagement Coordinator at CatholicCare Sydney, where she engages young people, schools and parishes with the work of the agency. In 2017 Ashleigh was the Australian Youth Delegate at the Vatican, where she participated in preparatory meetings for the upcoming Synod of Bishops on Young People. Ashleigh has a background in interfaith dialogue and is passionate about helping young people cultivate their unique skills and passions to make a difference in the world.